Days Of Thunder [iTunes link] - Talk about a strange movie license. I thought "School of Rock" was a dated movie license. 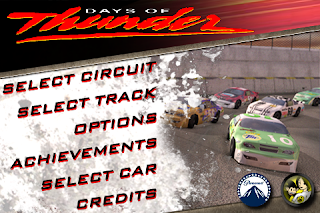 "Days of Thunder" is from the 1980s! When Tom Cruise and Nicole Kidman were still together! Anyway, this stock car racing/smash'em up is available for $.99 for a limited time. I'm planning a video review for this game and so far it's worth the buck. I'm not sure if it's worth its $4.99 regular price. Rolando Lite [iTunes link] - If you never had a chance to check out the Rolando universe, here's your free chance to do it. It's very cute and if you like platform games you might want to put down $5.99 for the full game. Time Crisis Strike [iTunes link] - The first-person shooter franchise "Time Crisis" is now on the iPhone with "Time Crisis Strike." The initial reviews seem positive and the controls seem to be as good as "Brothers In Arms," it seems to suffer from the same drawback as "Silent Hill" - the entire game is too short. The size of Time Crisis is 23.4MB compared with 81.6MB for Brothers In Arms. $5.99. I'll wait for a price drop.